These are GORGEOUS! LOVING the glitter and the bikes!!!!!!!!!!!! This is such a sweet birthday card. Love the sparkly background and the accents on the bike are perfect additions. I just love that bike! I think it's going on my wishlist :) A happy card for sure! 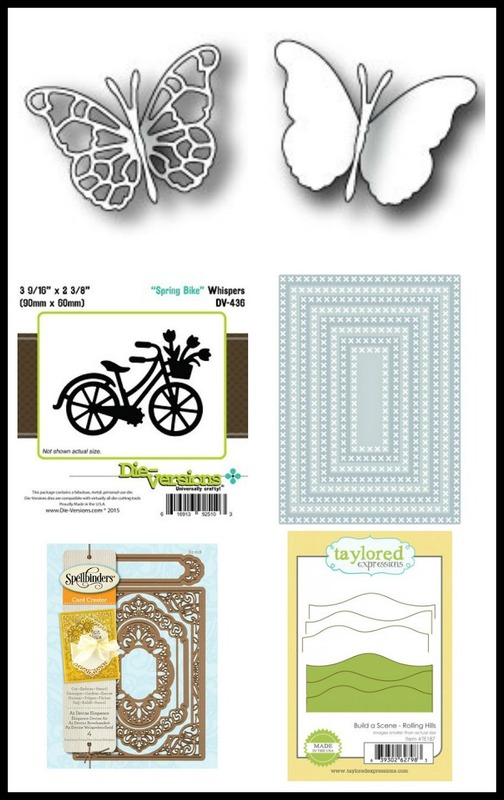 Gorgeous cards Sherrie! The bike die cut is adorable! I love all of the layering and how you created the backgrounds! 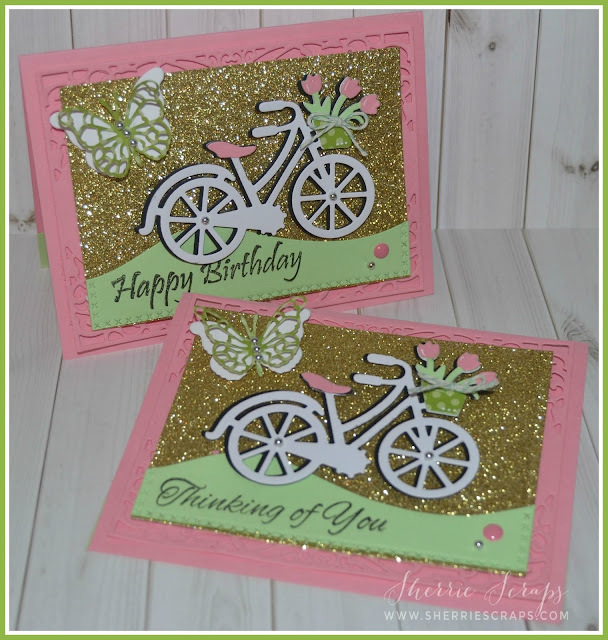 The sparkly papers are a great addition to your card! Beautiful card, Sherrie! So Cute! Thanks for sharing with us at Always Happy Birthday. Gorgeous card Sherrie I love the design and the bike is so fun. Beautiful cards Sherrie!!! I really love that bicycle die! So pretty with the florals! Thank you for linking up in our FFC This week!! This is stunning Sherrie! Love the glitter card stock and that bicycle is so cute! Fabulous design! I am ready to take a ride along the beach on this beautiful bike. Love the glittery background. Such a pretty card. Beautiful design. Thanks for visiting and leaving the sweet luv. Oh what a lovely card.Loving the glitter card stock. You always do such a great job. 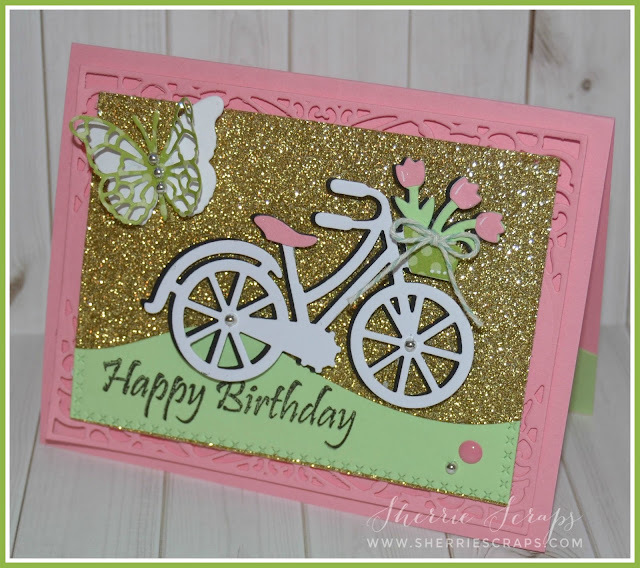 Beautiful card, Sherrie , Love the glittery background ! This card is really cute Sherrie! I just ordered a bunch of guys from scrappy land . I can't wait to use them ! Sherrie, your cards are so sweet! I love the layers of die cuts, and that sparkly background really shows off that cute bike! I love all the details! Sending hugs! I love this cute cards. 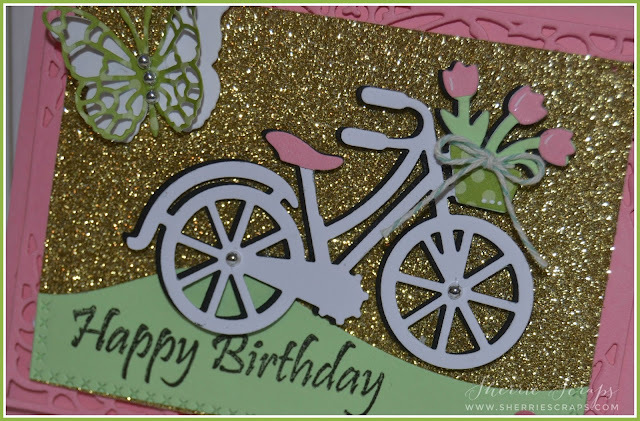 Love the sparkle background and the bike die. OOh how PRETTY Sherrie! I love the sparkle and the bicycle! Beautiful card! Beautiful and fun card! 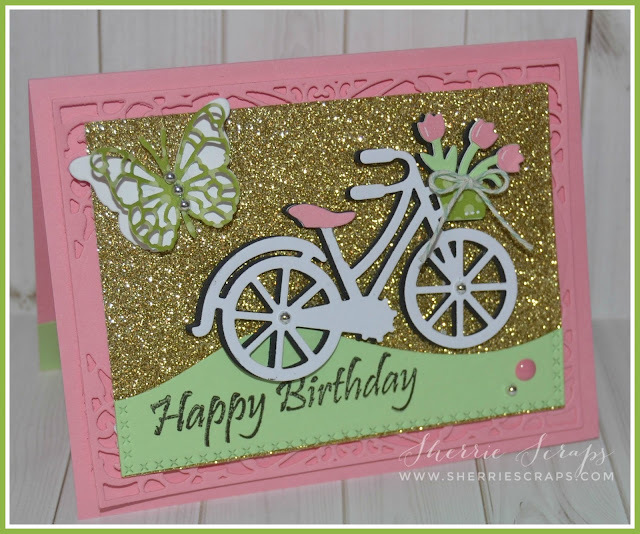 Love the sparkles and that adorable bicycle die! Such beautiful cards, Sherrie!! I have been eyeing the Die Versions Whispers Spring Bike Die for a while now!! It is so cute!! I love the touch of gold my friend! YOU rock!